The House on Thursday voted for a bipartisan plan to reauthorize but overhaul a federal program for giving money to state technical education programs, and a Senate leader indicated a companion bill might be coming in that body. House Resolution 2353 passed by voice vote, which means it was so popular nobody felt it necessary to count yeas and nays. 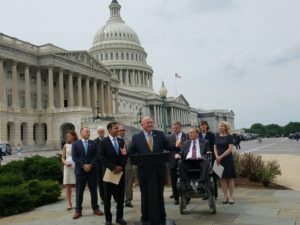 A large bipartisan group of sponsors, led by Reps. Raja Krishnamoorthi, D-Ill., and Glenn “GT” Thompson, R-Pa., backed the new version of the Perkins Act. The bill lets states use 15 percent of federal funds in rural areas or regions with a lot of vo-tech programs, up from 10 percent, according to a fact sheet published by the House Committee on Education and the Workforce. (That ought to help fund programs to teach more capital-intensive trades, such as collision repair.) It loosens and streamlines the federal strings so states can make their own decisions about the money — and if their own leaders are spending it correctly. Local leaders also have greater flexibility to dictate what industries get the money in their states, and the bill encourages business owners to participate in the process. Oversight of the program is delegated to the states, not the secretary of education — and your input as a business owner is encouraged. This and other elements of the law are meant to avoid politicization and decisions taken out of local hands. However, there’s still a federal level of oversight. States are required to publicly report to the states and feds how they’re doing, which is anticipated to keep everybody honest. It means auto body professionals should be prepared to check these results and raise hell if all their state’s dollars dollars went to underwater basket weaving instead of collision repair or to a collision repair program producing incompetent graduates. Federal scrutiny of the results will be done by an “independent entity,” again to avoid whichever party’s secretary of education is in power from mucking things up with politics. This sounds as though it could really help bolster vocational programs and be another piece towards solving the technician shortage, so long as it clears the Senate and Republican President Donald Trump. “Reauthorizing the Perkins Career and Technical Education Act is a top priority for Chairman Alexander this Congress, and he has asked Senator Enzi to continue to make progress on the great work he did last Congress to develop a proposal for the Senate to consider,” the office of Sen. Lamar Alexander, R-Tenn., said in a statement. Be heard: Senate contact information can be found here. The White House can be reached here.